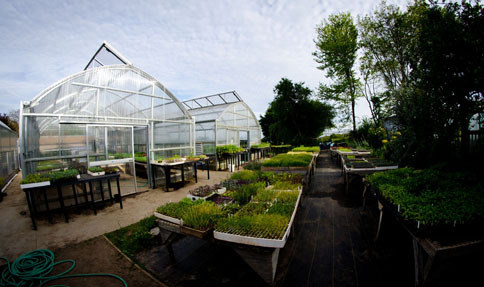 Generous donations helped fund new greenhouses at the UCSC Farm. Donations are essential for the Center’s continued growth and development, and our ongoing innovation and creativity as a leader in sustainable agriculture and food systems. Although we receive a small amount of public funding, most of our research, education, and public service work is funded through donor gifts, grants, fees, and sales from our Farm & Garden sites. To support the Center's work with an online donation or to find out other ways to support our efforts, please see the information below. Support the Center for Agroecology & Sustainable Food Systems Your gift supports the full range of the Center's work, including research, experiential education, and public service to develop and promote sustainable food and agriculture systems. Support the Friends of the UCSC Farm & Garden, the CASFS Community Support Group Your gift supports the public education, scholarship, and facilities improvement work of the Friends of the UCSC Farm & Garden. If paying by check, download and mail the membership form. Your gift supports operating costs for the Center's six-month Apprenticeship training program in organic farming and gardening. Support Apprenticeship Scholarships Your gift supports participants in the six-month Apprenticeship program. Support Food Justice & Equity Scholarships Your gift supports scholarships for low-income apprentices from historically underrepresented communities committed to and engaged in creating food justice & equity in their communities and/or advocacy for responsible stewardship of the Earth. Support the Matthew Raiford Scholarship for Veterans Your gift supports military veterans participating in the six-month Apprenticeship program. Other gifts by check to the Center can be made by downloading and filling out the Gift Form or with your own letter or note designating how you’d like your gift directed. Please make checks payable to the “UCSC Foundation” with a note in the memo line indicating CASFS, Apprenticeship, Friends of the Farm & Garden, Grow a Farmer Campaign, or some other designation. Gifts can be sent to the address below. For more information on making a financial gift to the Center, call Ann Lindsey, 831.566-3779, email alindsey@ucsc.edu, or write to her at the above address. Gifts of stock, real estate, and in-kind goods and services are equally appreciated as are donations from your business or matching gifts through your company. All gifts are fully tax-deductible and every penny counts. Join the Friends of the UCSC Farm & Garden. The Friends are a community-based group whose membership fees and volunteer efforts support a variety of education and scholarship programs. The Friends focus their efforts on community outreach, Farm & Garden facility improvements, and public education. Click here for information on how to join the Friends. Shop at the Farm & Garden Market Cart. Every Friday from mid June through late October, fresh produce and flowers are available at the Market Cart, located at the corner of Bay & High streets at the base of the UCSC campus. The Market Cart is open from 12 noon to 6 pm. For details, see the Market Cart page. Join the Center’s Community Supported Agriculture (CSA) project. CSA members support the Center by purchasing a weekly share of fresh, organically grown produce, herbs, and flowers. The CSA season runs for 22 weeks, starting in early June (weather permitting). Flower bouquet shares are also available. For details, see the CSA program page. Support our Spring Plant Sale. In 2019 the sale takes place Saturday and Sunday, April 27-28. For details, see our Calendar of Events.